Market Watch November 26: Easing lower - with a floor forming? Wednesday saw Russian stocks ease lower, while firmer metals prices provide some upside, as globally investors absorbed news of further rate cuts in China, a stimulus package proposed by the European Union, and some more gloomy data from the U.S.
After Wall Street eked out a minor gain on the back of the Feds latest bailout attempt overnight, the Asian markets continued wrestling with the same basic question during the day – will the bailouts and fiscal stimuli work or will the global economy soften to the point where an awful lot of negative economic date says its going? In Japan the trade off saw the Nikkei lose 1.3% as exporters managed to pick up some minor gains as the Yen weakened against the U.S. dollar, Hong Kong on the other hand staged a 3.3% gain, in light trade, with steelmakers rebounding in the wake of BHP Billiton's decision to walk away from Rio Tinto, and further impetus coming from rumours of another rate cut in China – which were confirmed later in the day with the biggest rate cut in 11 years. Sydney lost 2.6%, with resources and energy stocks down. The Chinese rate cut provided a fillip for crude and commodities which boded more positively for the days trade in Moscow. An initial sell off on the RTS saw it even up the ledger with the late falls on the Micex the previous session before playing out the rest of the day between 670 and 655, to close 4.89% lower at 658.43. The Micex climbed mildly through until early afternoon before easing back to below where it had started and finished with a 1.2% fall at 595.15. During the day Vnesheconombank also disclosed that the government had already outlaid $3.1 Billion on stocks purchases on the Russian market. Crude prices got enough of a kick out of the Chinese rate cut to see them bounce, with Nymex and Brent futures moving above $52 BL and the WTI spot price in the same ball park with cold weather in the U.S. and the expectation that this may see a decline in the weekly U.S. inventory figures adding some buoyancy. In Moscow this saw Lukoil (down 4.82%), Rosneft (down 5.48%), GazpromNeft (down 1.52%), Surgutneftegaz (down 8.35%) all lower, while Ritek (up 0.94%) managed a minor gain. Gas plays, Gazprom (down 2.51%), Novatek (down 12.51%) eased with energy prices. Also benefiting from news of the Chinese rate cut were base metal prices with Zinc and Copper up, but with Nickel and Lead easing later in the day. This saw Polymetal (up 9.80%) get traction with Polyus Gold (up 4.61%) gaining on the back of gold holding near 6 week highs. 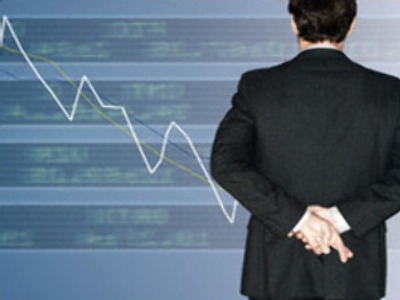 Norilsk Nickel (down 4.79%) fell despite the seeming resolution of its shareholder issues. Steelmakers NLMK (down 0.09%), Severstal (down 4.33%), MMK (up 1.24%) didn't move too far from the starting mark, with coalminer Raspadskaya (down 11.93%) getting a bath. Agricultural commodity producer Razgulay (down 6.50%) was lower with grain prices, and Uralkali (down2.28%) steadied its recent roller coast with a single digit percentage move. In the banking sector, state owned majors VTB (down 4.49%) and Sberbank (down 4.63%) were both lower while smaller private rivals Bank Moskvy (up 0.07%), Bank Vozrozhdenie (up 1.98%), and Rosbank (up 5.56%) saw some upside. The retail and consumer goods sector, upmarket supermarket chain Sedmoi Kontinent (down 11.98%) had another tough day on the shop floor while down market rival Magnit (up 2.58%) more than held its own. Pharmacy chain 36.6 (down 2.54%) was lower along with beauty products maker Kalina (down 0.91%). Dairy and drinks makers Lebedyansky (down 1.35%) and Wimm Bill Dann (2.78%) broke marginally both ways. Elsewhere, regional Telecoms, Center Telecom (down 11.32%), Southern Telecom (down 5.56%) and Volga Telecom (down 3.4%) lost ground except for their counterpart 11 time zones away, Dalsvyaz (up 1.16%). Also down were automakers, Avtovaz (down 1%), Kamaz (down 1.75%), and Sollers (down 6.27%), with IT service provider Armada (up 5.19%) getting good traction and the darling of the electricity reform set, RusHydro (up30%), getting a major boost after its recent hammering. Whilst this was unfolding in Moscow Europe was undergoing a similarly hesitant day. An afternoon rally couldn’t do more than limit the downside on the FTSE 100 to 0.44% as resources rebounded after Tuesdays BHP Billiton/Rio Tinto inspired wobble. In Frankfurt a similar afternoon rally saw the Dax post a 0.08% gain with Volkswagen up 15%, and in Paris that same afternoon rally still left the Cac 40 down 1.24% despite Michelin, Peugot and Renault getting some life out of the engine. Across the Atlantic the day opened with yet more grizzly economic data, with drops in durable goods orders and consumer spending for October. Despite this stocks have picked up steam from the technology sector as President-elect Barrack Obama chose former Federal Reserve Chief Paul Volcker to head up an economic advisory board, and indicated he would unveil a plan to bolster economic growth on ‘day one’. At the Wednesday close, having powered to the Thanksgiving holiday, the Nasdaq was up 4.6% with the Dow up 2.91%.